By way of remembering King of Tory Island Patsy Dan Rodgers, who has passed away aged 74, we're revisiting Kieran Devaney's acclaimed Documentary On One production, The Last King Of Ireland. Listen to it above, and read Kieran's introduction, written before his passing, to the magic of Tory - "a doorway into another world" - and his friendship with the legendary Patsy Dan below. The jovial stranger stood out from the regulars when he walked into the bar at the United Arts Club in Dublin where I was perched on my usual corner stool. He was a stocky little man in his early sixties wearing a neatly ironed white shirt, a striped tie and a double breasted navy blue jacket. A blue serge nautical cap was perched jauntily over his ears which were adorned with four gold earrings – three on his left ear and one on his right. He carried an old battered black leather accordion case under one arm and used the other to wave to the barman. In a Donegal accent he ordered a large Bushmills and Red Bull, which he referred to as a lethal injection. He introduced himself as Patsy and sat down beside me and insisted on topping up my glass of wine. Patsy unfastened the case’s worn straps took out the accordion and started to play. It’s called "The Waves of Tory" he shouted, and I realised I had just met a living legend who was to become a lifelong friend. 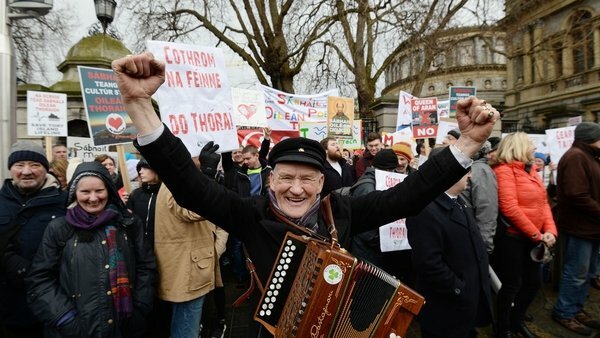 Today, at the age of 73, Patsy Dan Rodgers is known as the Last King of Ireland. He’s ruled his remote North Atlantic fiefdom of Tory Island for almost a quarter of a century. His is not an hereditary title. He was elected by the people of Tory who can trace an unbroken lineage back to a saint Colmcille who granted the title to an Islander in the fifth century. Over the centuries led by their Kings – and in at least one case a Queen – the Islanders have beaten off Vikings, marauding pirates and invaders from the mainland which lies nine miles off the coast across some of the most treacherous waters off the Irish Coast. Today, around 150 people live a precarious existence on the Island which has two villages – West Town and East Town – one Tarmacadam road, a church, a lighthouse, one hotel, a social club and a convenience store which also doubles as a post office. For the Documentary on One I’ve been recording Patsy Dan’s colourful and somewhat eventful life as he battles to preserve his Gaelic culture and a way of living some in authority would argue has no place in the 21st Century. Tory Island is a vibrant community well versed in the Irish language music and culture. "It’s like a doorway into another world," one visitor told me. I was an honoured guest at ceilidhs and sessions where the cream of Irish musicians and singers travelled to the Island from all over the world to be able to say they had performed with the King. I discovered Tory Time when Ceilidhs finish at 3.00 am to allow the Island children to have their discos and the Sean-nós singing resumes at 7.00 am when the youngsters are safely in bed. Since that chance meeting in the United Arts Club where Patsy was exhibiting his work I’ve watched the Tory School of Primative Painting grow to one of international stature. In the Documentary on One we hear how Patsy owes his career to an Englishman who taught Prince Charles how to paint. And we learn why the Prince who will one day be King of England wants to make a pilgrimage to the Island to meet the man who is already a King. We’ll hear the story of the cursing stones which were evoked to save the Islanders from eviction in the 19th century and join the King and his subjects when they march on Leinster House to fight off a 21st Century threat to their way of life. Sadly our days of Large Bushmills, Red Bull and white wine are over. Patsy and I have both been diagnosed with cancer. In my documentary, the Last King of Ireland talks candidly about his fears for the future and the legacy he will leave behind. But like any professional fighter he is far from throwing in the towel. I went to visit him in Intensive Care at the Mater Hospital in Dublin. The nurse who came to the video intercom above the door to the sterile unit explained that only close family members were allowed in. "Please tell him I’m here," I said. She returned and told me: "Your brother will see you now." Inside, Patsy Dan lay wired to screens and machines surrounded by doctors and nurses in gowns and masks, with his battered old accordion under the bed. He winked at me and I’m sure he mouthed "We’ll beat this one yet." And sipping a glass of Ballygowan back at the Bar at the United Arts Club where our friendship began I can’t help thinking that he may be right. Listen to more from the Documentary On One archives here.